Will PG&E Finally Get Approval for Its EV Charging Pilot? The utility’s new plan will cost less for ratepayers. But EV charging companies are still worried about utility control. Pacific Gas & Electric has struggled to put together an electric-vehicle charging plan that can get approval. Its last plan was rejected by California state regulators in September, largely because it asked for far more money, and more utility ownership of EV charging assets, than did its fellow investor-owned utilities in Southern California. Last week, PG&E took a step toward closing the EV charging deal, with its Charge Smart and Save plan. The Northern California utility has scaled down its new plan, asking for $160 million for 7,500 charging stations, compared to last year’s request for $654 million to build 25,000 chargers. Like its fellow IOUs, PG&E plans to install many of its chargers at multi-unit dwellings and workplaces, which are more challenging for private-sector EV charging economics. PG&E has also committed to deploying at least 15 percent of its charging stations in disadvantaged communities, and to keep the rate increases to pay for it to less than $2.75 per year for a typical residential customer. These changes have earned PG&E’s new plan the support of various environmental and consumer groups in the form of a settlement agreement similar to those obtained by SDG&E and SCE. That agreement could give PG&E’s new plan additional weight with the California PUC. The new agreement has been approved by energy policy groups, including the Center for Sustainable Energy, the Sierra Club, The Greenlining Institute, the Natural Resources Defense Council, EV charging startup Greenlots, EV promotional group Plug In America, automakers General Motors and Honda, and community choice aggregation entities including Marin Clean Energy and the Sonoma Clean Power Authority. EVCA’s main complaints center around the level of control PG&E is seeking over which type of charging equipment is used, which companies can be involved in operating the units, and how their services will be priced. “The proposal leaves open significant unanswered questions about the program design, including responsibility for network management, the ability of site hosts to implement innovative pricing models, the ability of PG&E to pick winners and losers in the market, and impacts to a competitive marketplace,” wrote the group. 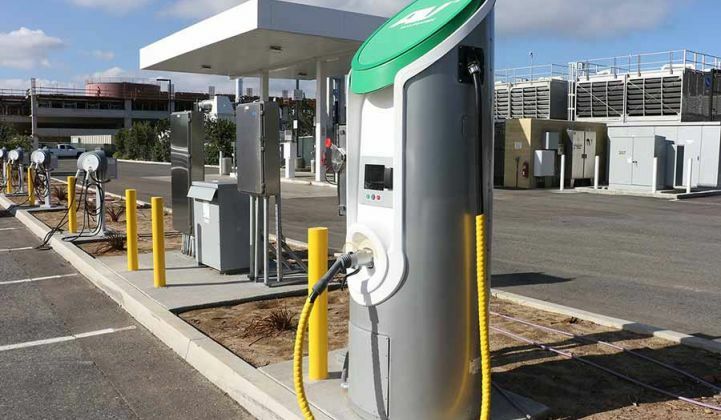 Like those of its Southern California counterparts, PG&E’s new plan opens up the option for site hosts to choose the charging technology for the 7,500 level 2 chargers it hopes to deploy, even though the utility is seeking to own the charging equipment itself. What’s more, the 100 DC fast-charging systems that PG&E wants to install will be selected in a single-vendor process, and will come with significant restrictions on the pricing of power they use, he said. That might set up the utility as a direct competitor to the fast-charging networks being deployed by companies like Tesla, eVgo and Nissan, he noted. EVCA also complains that PG&E’s proposal for 7,500 chargers is nearly three times the number the CPUC advised the utility to ask for in guidance last year. It also stated that the utility's plan comes at a cost per EV charging port of about $21,000. Private-sector systems cost $8,000 on average. Update: The NRDC pointed out in an email that EVCA's cost-per-charger figure is inaccurate, as it divides total program costs including non-device costs by the number of chargers being planned. Any cost overruns could expose the utility’s ratepayers to covering those costs, something that has caused ratepayer groups including The Utility Reform Network and CPUC’s Office of Ratepayer Advocates to withhold their support of PG&E’s plan.